The site of the current MBTA commuter parking lot and the brick building to the east, now 200 Andover St., is all that remains of the once thriving businesses of the Ballard Vale Machine Shop, 1847, a Rubber Co. firm, Whipple File & Steel Manufacturing Co. 1855 - 1869 and Craighead & Kintz Co. 1883 - 1896. The building was built of stone, was three stories high and covered two acres of land. The building was built by John Marland, Manufacturer, son of Abraham Marland. The stone to build the plant is said to have been hauled four miles through the woods to the site. First known as the Andover Mechanic Association in Sept. 1846 then the Ballard Vale Machine Shop. An excellent map of the company holdings in the Village was created by Franklin Darracott in 1848 and is now at the Andover Historical Society. John Marland was also one of the principle owners of the Ballard Vale Company woolen mills on the adjoining site to the east. Marland had a 200 acre homestead estate on the east side of the Shawsheen River. He and partner John Howe Jr. purchased land along Andover and Tewksbury Street for housing development and shops. The land was parceled off and then each lot sold at auction to the highest bidders in 1847. These lots comprise the core center of Ballardvale Village today. The Andover - Wilmington Railroad opened in 1838 crossing Preston's Plains, now much of the campus of South Elementary School, through the Andover Rec Park, Spring Grove Cemetery, down Abbot St. to Central St. and terminating behind the Memorial Hall Library. The rear wing of the library was the site of the Andover Depot. It was later extended to Haverhill and points north. The Boston & Maine Railroad purchased the line and relocated the tracks to the present route in 1848 to accommodate the new industrial city of Lawrence, MA. The area of the Andover Safety Center from Lewis St. to Essex St. housed the buildings for construction of railroad cars for the old Andover - Wilmington line. John Marland saw the opportunity of constructing a machine shop on this site to build and repair engines for the newly formed B & M RR. The new line location would also improve business along the route for transporting raw materials and finished goods to and from the mills and factories. A railroad spur line was constructed across the property and down Sand St. now called Dale St. in 1848. Ballard Vale Machine Shop – Sept. 28, 1848 – b. 402 leaf 145 Deed – "Land to the rear of their building and the rear of the Boarding houses of the Ballard Vale Co., three rods 16 links on (Andover Street) near the R.R. crossing and near the Brick Boarding house, northeast 48 rods 16 links to the rear of the boarding houses, containing one acre 15 9/10 rods. – reserving the right to add to switch from the R.R track, now laid into the B. V. Machine Shop’s yard at the most convenient point for making the necessary curve on sd. Track to get to the Ballard Vale Company’s store house." Sadly John Marland became insolvent in 1849 and all the assets of the company were then taken by the investors. The B & M Railroad built a repair shop and engine roundhouse in South Lawrence and sold off all their holdings in Andover about 1850. 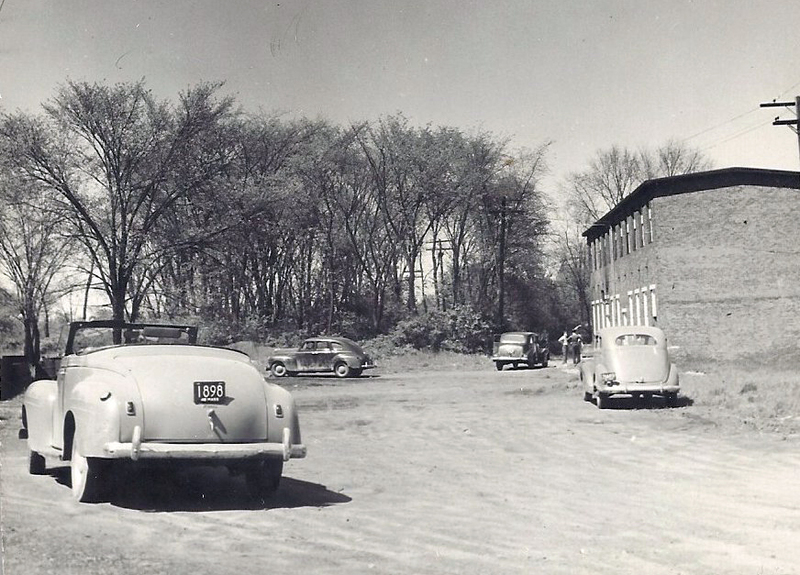 The stone mill property was then leased to a Rubber firm which was sort lived at this site. The Whipple File Co. purchased the complex on June 16, 1859. William P. Pierce was the president of the company. They later were renamed the Whipple File & Steel Manufacturing Co. to the brick warehouses of the Ballard Vale Mill Co. It is interesting to note the the Whipple File Manufacturing Company was so close to the lot line of the Ballard Vale Mills that their building eaves and gutters were projecting over the mill land. Air rights were settled on July 10, 1865 as well as ownership of ice cutting on the mill pond. 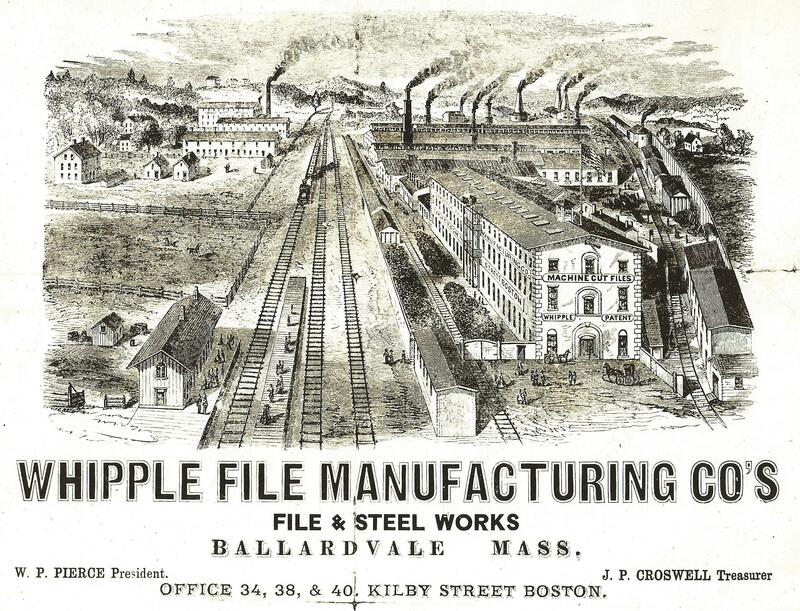 Whipple File & Steel Manufacturing Co. went bankrupt in 1867 and the company assets were assigned to Edward Page, John Beale, Thomas J. Horner all of Boston, and Thornton Lathrop of Milton, MA. The Property was auctioned off on April 27, 1870 to George W. Simmons and George H. Mackay who purchased the plant and all related properties. Simmons held 2/3 share at $20.706.67 and Mackay 1/3 at $10,353.33. The deed was not recorded until July 7, 1871. George W. Simmons was a Wholesale clothing merchant in Boston and George Mackay, also a Boston Merchant. Mackay would deed his share of the property to Simmons on Jan. 20, 1880. George Simmons died on Dec. 14, 1882 in Boston of Bright's disease. His estate was inherited by his wife Frances A. (Gay) Simmons and their children. It has been stated that this plant sat idle for 13 years. We do know the the Ballard Vale Stoneware Co. occupied a portion of the rear of property in the 1880s. It also operated under the names of Weston & Willard Pottery, Willard & Sullivan Pottery and Willard & Sons Ballardvale, Mass. The Simmons heirs would sell the estate Ballardvale property to Craighead & Kintz on June 27, 1883. Craighead & Kintz Manufacturing Co. of Connecticut made artistic bronzes, plaques, inkwells and daylight lamps. They were famous for their "Daylight" lamps which were the latest word in artificial oil lighting fixtures. The company salesroom was in New York City. A base relief bronze plague, finished in gold and silver, 10" x 12" listed for $11.25 in the company catalog. The company provided jobs for "many young men to learn the trade of buffing, polishing, molding and pattern making." "A number of expert workmen, the majority of whom were German, moved into Ballard Vale with their families. Among the newcomers were the Hoffmans, Schneiders, Quinns and Trautmanns." Perhaps the invention of electric lighting (1889 to Andover) slowed down production of the lamps and the company was insolvent. Another attempt to restart manufacturing but by 1896 the Craighead & Kintz plant had closed in Ballardvale. The vacant building sat idle for a few years until the start of the Spanish - American War in 1898. Wool merchants in Boston, fearing that the city would be bombarded by Spanish warships sought to move their raw wool supplies out of harms way. The stone plant building offered a safe location. The building was then used to storage which had been loaded in the end of April continued in May. On May 11, 1898 workmen repairing the tin flashing on the roof left a hot iron on a box near the front of the building about noon time. 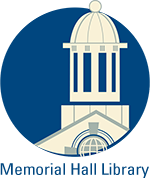 "The fire started about 12:30 p.m. in a pile of timber and rubbish near the wall of the southeast end of the main building. The flames quickly caught in the bales of wool in the building and then spread with amazing rapidity until the whole main building was a mass of flames." 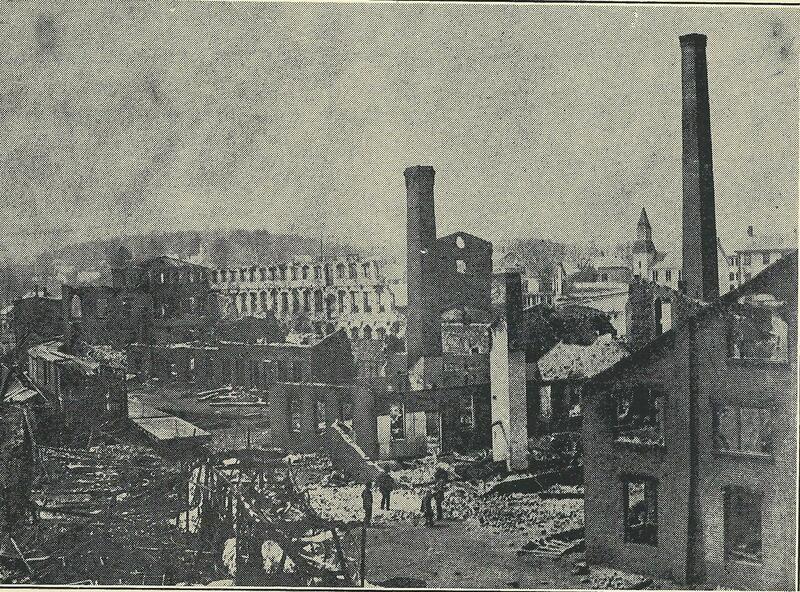 The entire complex was a complete loss as were five freight cars on the spur line, also loaded with wool bales. Ballard Vale Machine Shop 1848 Darracott map. Map plan #5017 B – Aug. 6, 1917 – Ctf. #669 – Lyster Chemical Co.
N. W. Hazen – June 13, 1845 – b. 354 leaf 130 mtg ? Thomas C. Foster – June 3, 1850 – b. 422 leaf 115 – mtg. ? 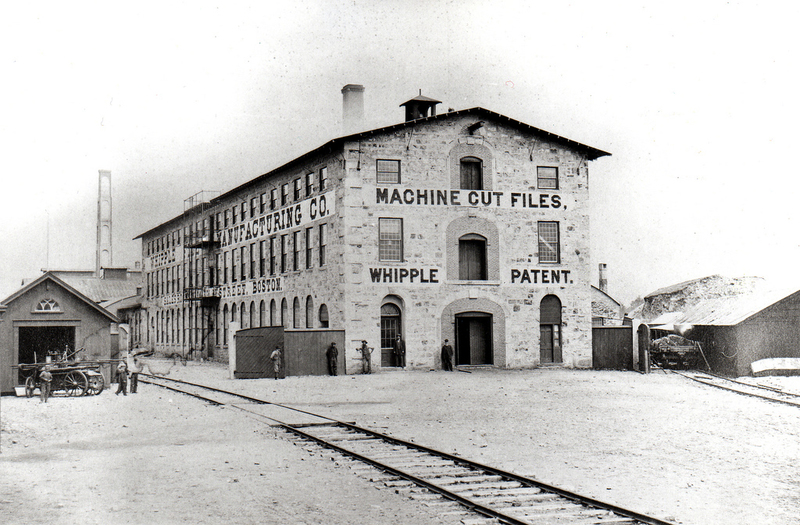 Whipple File Co. – June 16, 1859 – b. 589 leaf 244 – Mechanics St. & blds. Two Hundred Andover Street, LLC – July 18, 2008 – Ctf. #77747 ? Whipple File & Steel Manufacturing Co.